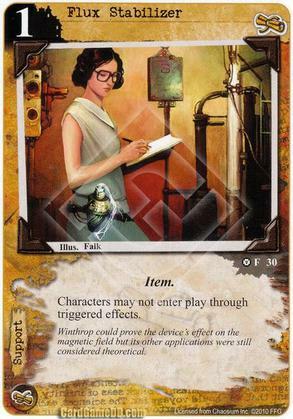 Flavor Text: Winthrop could prove the device's effect on the magnetic field but its other applications were still considered theoretical. Does Flux Stabilizer stop a character Dormant card from entering play through the Dormant machanic (story is won and character enters play at no cost)? Nothing in the Dormant rules indicates that Dormant would be a triggered effect (Action:, Disrupt: etc. ), either when playing to a story, or playing from that story when it resolves. Thanks! That makes sense to me!